Need an evening suit or tuxedo alternative that is packed with show stopping style. 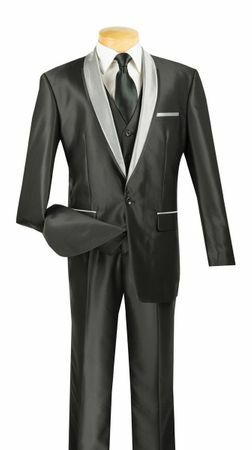 This shiny black and silver 3 piece suit by Vinci has those items checked off on your shopping list. Featuring a stylish round shawl style collar, side vents on the jacket with the matching vest and pleated pants all made of shiny sharkskin poly/rayon.